I’d probably be close to having a heart attack, or maybe even packing my bags in rapid succession, too. So, so very sorry. 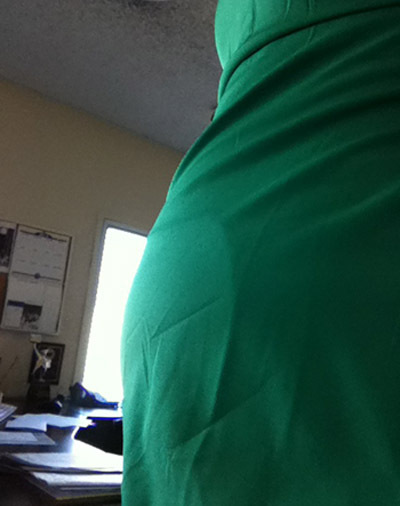 This afternoon I was engaged in an email conversation with a girlfriend of mine who has yet to see my oh-so-pregnant belly, and I was trying to describe to her the size of it. I equated it to the size of rancher, and then followed that up with predictions of being the size of a house in two or three months, and the size of an Aaron Spelling sized mansion by the end. She didn’t believe me. Shocking, I know! So, I figured I’d send her picture evidence. I took a picture with my iPhone, and sent it via text. However, said girlfriend recently got a new number that I hadn’t yet programmed into my phone. 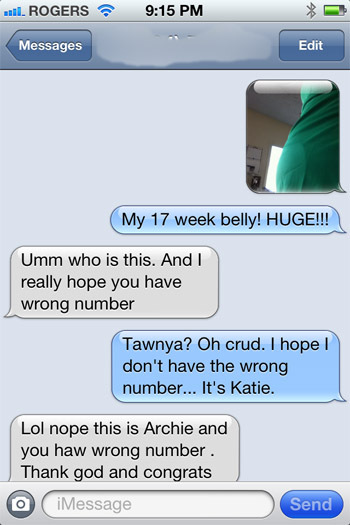 So I had to type it in, and it seems I typed a 7 instead of a 6, and good ol’ Archie got the surprise of a lifetime. Archie’s worst nightmare was first published April 13, 2012.